GYLA MARMONT SMITH passed away on May 23, 2016, six days before her 92nd birthday. 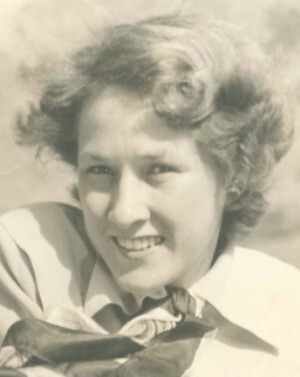 She was born in Shelby, Montana in 1924 to Frank and Marguerite Marmont, and was one of 5 children. She graduated from Montana State College in 1947 and was co-director of the Hiawatha Field House in West Seattle for several years. She married Hugh E. Smith in 1949 and moved to Carmel, CA, where they raised three daughters. She began teaching Parent Effectiveness Training (P.E.T.) in 1969 and earned her MA in marriage and family counseling from Goddard College in Vermont in 1976. She taught P.E.T. and communication classes worldwide, including in Saudi Arabia, Nicaragua, and the Virgin Islands, and her teaching experiences and accomplishments brought her great joy. 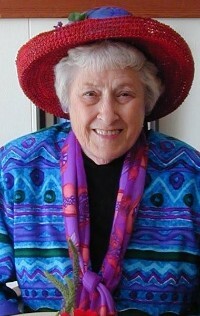 Gyla moved to the Seattle area in 1981 and continued teaching and counseling well into her 70s. She loved flowers, gardening, camping, and picnics outdoors. Glacier National Park was one of her favorite places, and she was able to return there for a visit last summer. She delighted in sharing her flowers, food, and talents, and was always eager to brighten someone’s day or lend a helping hand to family and friends. She is survived by her daughters, Alesa Lightbourne (Rich Vicenti), Ginny Smith (Don Moore), and Randa Smith; grandsons Marc Penso, Neil Penso, and Joel Silverberg; niece Gyla Scheffer Steiner, and several other nieces; and four great grandchildren. A celebration of life will be held at a later date—most likely a picnic! Thank you for including obituary notice in Monterey Herald. Fondly remember Gyla, especially during those days studying Parent Effectiveness Training and lessons from "Your Inner Child of the Past". Especially recall attending Bob Bless's stressful roll playing seminars where we learned honesty and expressions of truth as early as possible was the best way out. Always hopeful Celiac Artery repair was lasting comfort in her final years. Expression of Condolences to all family members, attention Alesa, Ginny and Randa. My fond memories of Gyla are from my close, long, childhood to adult friendship with her daughter, Ginny. Mrs. Smith always had something fun planned. I remember she put on the best carnival in their backyard one summer. She was our Girl Scout leader and took us camping often. She taught us gymnastics at River school. We made taffy many times at the house (she always did the hard part, pulling it when it was so hot it burned). She even got me to attend one of her PET classes. She was a special lady, always full of life and interested in everything. My love goes out to Ginny and her sisters. Condolences to the Smith family. Our thoughts and prayers go out to your whole family. Psalms 147:3 says God, "heals the broken hearted, and binds up their wounds." May God bring you comfort and peace.